It was therefore with great pleasure that a couple of weeks ago I was able to ice skate for the first time EVER. And I utterly adored it, though I knew I would. We were lucky enough to then be offered a family ticket to go to Westfield ice rink at the Stratford site; sadly after I was laid up from an operation. However, we didn’t let that stop us and the kids and Brad all bundled off in the car to give it a go. 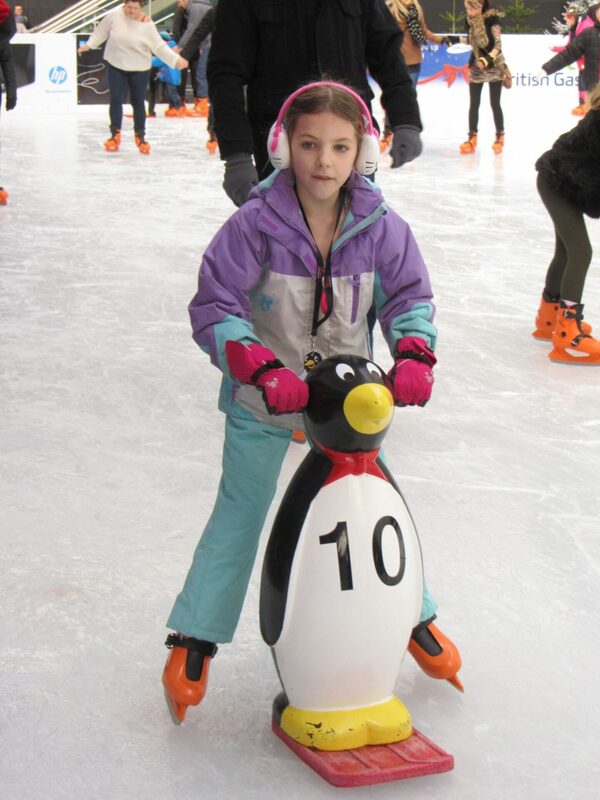 And no, that isn’t some cryptic ice-rink speak; the younger ones on the ice at Westfield, and most other rinks, can use either a seal to sit on, or a penguin to give them extra balance. I really needed have worried. The ticket prices are quite reasonable as well, considering the massive cost of erecting the rather impressive rink. A family ticket is £31 for the session (including a booking fee), and that’s for two adults and two children. We collected our fetching blue skates quickly, and were given penguins for both the kids, and off they went. The children gained confidence on their friendly ice-nursemaids super fast, and after only half the session had ditched them in favour of either frantically grabbing for the sides, walking / skating gingerly, or landing on their bums. Neither of them seemed to mind the trips to the ice though. Too much fun was being had both in getting up, and getting down there in the first place! Stuntboy seemed to delight in sliding everywhere deliberately while trying to get up so a Westfield Crew member was dispatched to try and rescue him from the ice…he was definitely keeping them busy. I do recommend that you take a change of trousers, or get them to wear sallopettes though, as the ice can get pretty wet even when its not actually raining. As the rink is outdoors, there is the danger that the British weather will make your time a little challenging, so coming prepared is always a grand plan. Both children spent the 45 minute session with a permanent grin on their faces; they took very well to it, and by the end of the session both were eager for more; so we may very well find ourselves back on the penguin before the winter is out. After the Ice Skating, there was plenty to do in the shops as well, from free craft sessions, to a Gangnam Style-y dance in front of some rather twinkly looking Christmas Trees! Have you been ice skating this winter? How have you found it? Westfield Ice Rink; the kids did rather well, wouldn’t you say? And yes, that is Stuntboy and Chatterbox doing Gangnam Style in front of a Christmas Tree….